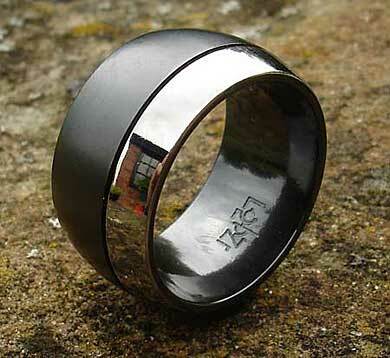 Men's Unusual Domed Wedding Ring : LOVE2HAVE in the UK! 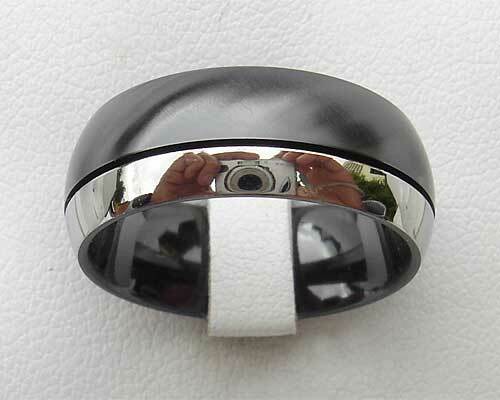 A men's wedding ring with an unusual two-tone design. Two tone rings are one of the most popular design choices when it comes to choosing a men's wedding ring. Our zirconium rings fit the bill and as you can see the distinct contrast between the natural and the black of the zirconium immediately catches the eye. Not only this, but the value for money advantage is yet another reason as to why you should be considering a wedding ring made from this wonder metal. 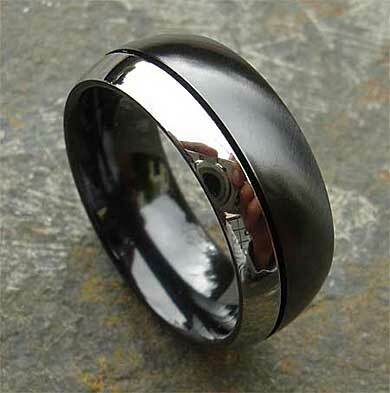 Here we have a domed style two-tone black and natural coloured zirconium wedding ring for men. The version pictured here has a highly polished natural colour rail, and if you look closely, you can see the reflections of the camera used to take the images. The shiny rail comes separated from the black with a thin but quite distinct groove. It comes in other finishes other than the one pictured here. Please state in the comments box at checkout what combination of finish is required such as polished black and satin natural or satin black and polished natural. Finally, there are some widths to choose from including the most popular 7mm and the very wide 12mm, something here to suit everyone. Finish(es) Available: Polished or satin matt combination.